I already feel such love and gratitude as we look forward to our future together. I am giving thanks for so much we cannot yet see – the relationships we will build and the ministry we will share – the joy, tears, and opportunities. I am also feeling at least some nervous expectation. Meg and I are eager to begin making a home among you in a few short months. May God bless and guide us in the years ahead. The Rev. 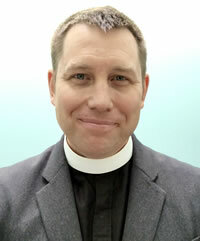 Canon Michael Buerkel Hunn grew up in New Mexico and Texas. In twenty years of ordained ministry he has served as a parish priest, a school chaplain, college chaplain, and Canon to Bishop Michael Curry. He currently serves as Canon to the Presiding Bishop for Ministry within The Episcopal Church, is Director of Communications, and oversees other key departments. He led Bishop Curry’s transition team and led a staff-wide restructure and culture transformation process. He supports the Presiding Bishop’s ministry in 108 dioceses and 16 countries. The Rt. Rev. Michael L. Vono, D.D., has announced his intention to retire in the late fall of 2018. The Rev. Canon Michael Buerkel Hunn will be his successor and the tenth Bishop of the Episcopal Diocese of the Rio Grande.